I've never spent much time in Playa Vista. Actually, I've spent more time in the Home Depot in Playa Vista than exploring the emerging community. To be honest, the massive apartment developments left me feeling a little dead inside. At Entertaining Adventure, we crave history, public art and quirkiness in our hunts. Pre-planned communities never seemed like the perfect fit, until we actually started exploring. 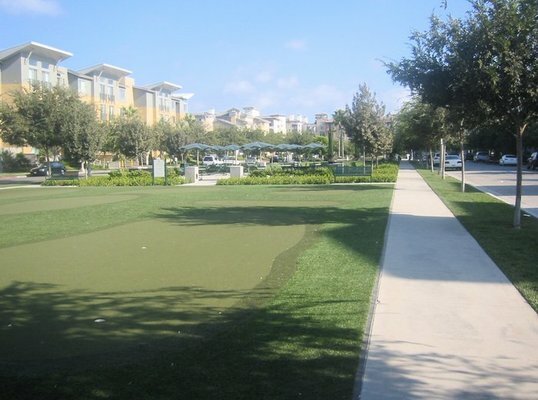 One of our favorite finds is the putting green at Crescent Park (Playa Links Putting Green). The narrow park, about two blocks in length, is a perfect way to spend an afternoon working on your putt. We don't have much miniature golf going on in the L.A. area, but this is the next best FREE thing. No crowds, free near-by parking and umbrella covered tables provide a perfect space to spend a quiet afternoon with friends or family. Scavenger hunts are the perfect opportunity to discover hidden gems of Los Angeles, whether it's public art or a new bike rental center. Creating clues is our favorite part of the job because we are making new discoveries every day. This blog will reveal some of our favorite spots throughout the city as we discover them, and it will also be home to Clues For You, hopefully getting you off of your computer or phone and out into L.A. to find some treasures yourself! Downtown Culver City has been a personal favorite for us long before our scavenger hunt business began. We love the movie-making history that makes it one-of-a-kind and more than just a nice retail area. Wizard of Oz was filmed here! John Wayne owned a bar! It can't get more old school Hollywood. The public art in Culver City is reason enough for hanging out for an afternoon. My favorites are the seven unique zoetropes by Wick Alexander and Robin Brailsford. Each spinning cylinder tells a story through animation, and they all pay homage to Culver City's film studio history. These aren't easy to find, but when you find one--take a spin and add a little unexpected fun to your day. Head out to Culver City, park for free (2 hours) in the public parking lots and take a zoetrope for a spin! Even better, go between 4 and 7 and hit Kay'n Dave's happy hour--$3.00 margaritas.